With the BVF, Isabellenhütte Heusler has developed a precision resistor that not only impresses with its unique overall size 1213 (3.1 mm x 3.3 mm), but also with its extremely high load capacity and precision in use. Smaller electrically-operated applications in particular benefit from the properties of the high-performance component that Isabellenhütte has now included in its series repertoire. With its small overall size, the BVF is currently unique on the market. The temperature coefficient of the BVF precision resistor is just under 70 ppm/K. The thermal resistance is also extremely low at 10 K/W. This results in the high load capacity of the BVF of 3 watts at up to a temperature of 145°C at the contact point. Due to the sturdy design in the proven ISA-WELD® technology, the component is suitable for a temperature range from -65°C to +175°C and is therefore above the current required limits for typical automotive applications. 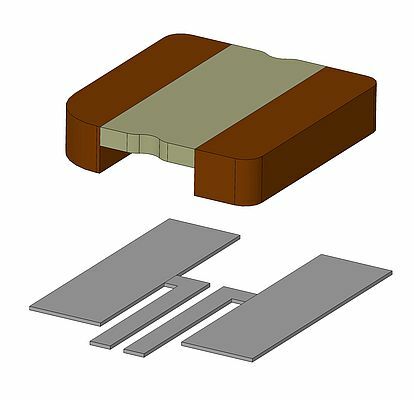 The application of the ISA-WELD® procedure developed by Isabellenhütte in conjunction with the material NOVENTIN® allows for maximum design flexibility.